If you’re planning to have a kickass sangeet, mehendi, wedding reception or any other social event in the western suburbs, then we have just the place for you. Flag's Avant Garde, Andheri West is one versatile venue that you can bank on for all your wedding needs. From a lawn to a lavish banquet hall - they have it all! They started off in 2005 when brothers Lawrence and Joseph Sequeira decided to introduce Vegetarian Fine Dining and established the S.B.S Food court in Malad. Flag’s Veg World Cuisine in Malad was their first venture and to say that it was a successful one would be an understatement. The restaurant became so popular that they established the Flag’s Marriage and Party Hall in 2008 in Goregaon. And seeing as the demand for their incredible food was only growing, they followed up with another restaurant in 2011. The next venture was the Flag's Avant Garde in Andheri West, another prime locality that would be a turning point in their business. No matter how many fab restaurants they keep introducing, their demand doesn't seem to curb and this time, the non-veg section wanted in as well. So what they have now in Andheri West is amazing food and service that includes a non-vegetarian spread, multiple party areas and some great alcohol as well! Ideal much? Flag's Avant Garde was established in 2015 and within a year, it has become one of the most sought after places for social events and fine dining in the vicinity. Read on to find out more about this stunning venue! This elegantly built banquet hall is one of the finest in Mumbai and boasts of tastefully done interiors and a sprawling space for receptions, sangeet and other events. This pillar-less hall is named after their father - Mr. Albert Sequeira. It can accommodate up to 500 people in floating style, making it ideal for a wedding reception. Named after their brother, Mr. Richard Sequeira, this open air party area is perfect for cocktail parties, weddings and receptions. Their creative decorators can convert the space into an outdoor lawn, where you can celebrate the special day amongst a beautiful atmosphere. You can even have all of your friends and fam to join in on the celebration as it accommodates up to 600 people! An open air space that is perfect for those intimate parties and receptions. With a capacity of up to 200 people, the terrace can be used as an individual party area or can be converted into the dining area while you host your ceremonies at the other party areas. Party Lovers Unite! Specially designed for some nights you’d never forget, this banquet hall has a capacity of 225 people and can be decorated to suit the theme of your party. A rocking DJ is all you need to set the mood for some amazing parties! Flag’s Avant Garde is situated just off New Link Road in Lokhandwala, Andheri West. Set in one of the prime locations of Mumbai, it is easily accessible by road and rail. Among other facilities, its convenient location makes it a popular choice for guests coming in from all around the city! 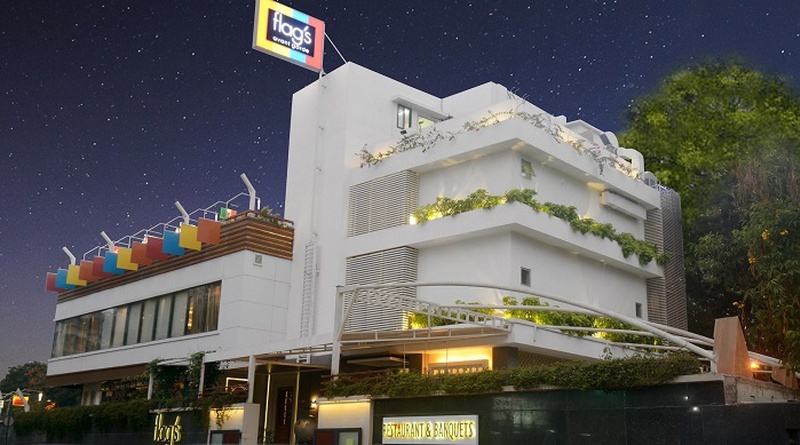 Fine dining, an exhaustive range of delicacies, a well-stocked bar and stunning decor are some of the many facilities at the Flag's Avant Garde. Flag’s has in-house decorators who can complement the elegantly built party areas with the perfect decor. From creative floral arrangements and drapes to the gorgeous lighting - they can do it all. When you host your event at Flag’s Avant Garde, their in-house staff make sure that the feast is going to be off the charts! What’s more is they have separate veg and non-veg kitchens, allowing everybody to have a good time without worrying about what’s behind the scenes. You can trust that all that you receive will be at its best. If you are planning a sangeet or cocktail party, their well-stocked bar will be just the thing you need! The management also promises impeccable service with attention to detail and finesse in whatever they do. Best part is they’re personally present around the events to make sure that it all goes smoothly and you’re not fretting about a single thing! Flag's Avant Garde has many patrons who vouch for the venue and the management. These families have come back many a times to host various events at the venue. Take a look at what the patrons have to say!